Thermometer has an easy-to-read 3" Face, and 1/2" MPT threads on the back to connect to your kettle. The metal stem is durable and won’t break like glass can. Our reviewers agree that this is a great thermometer at a great price! Temperature range is 20-240F/0-110C. Calibration screw is 1/16th" hex nut. Does it include mounting hardware? BEST ANSWER: This thermometer does not include mounting hardware. It has 1/2" male pipe thread behind the face, making it ready to be installed on a kettle with a 1/2" female pipe thread port, or it can be installed using the 1/2" MPT x 1/2" MPT stainless bulkhead (H727). The thermometer and bulkhead can also be purchased as a set (WL313). These are great thermometers. Easy to adjust (but a little too easy to mess up - don't turn it by the "face" when installing). They also do not come with an allen-wrench to adjust and the one you need is very small. You should also purchase one of morebeer's spirits based thermos to use as a calibration tool for this thermo. The only thing I'd caution about this one in particular is the probe length. It's too short for a mashtun. I was getting a lot of temperature drop over an hour because it wasn't penetrating deep enough into the mash. A 6" prob solved that and my mash temps are now solid. 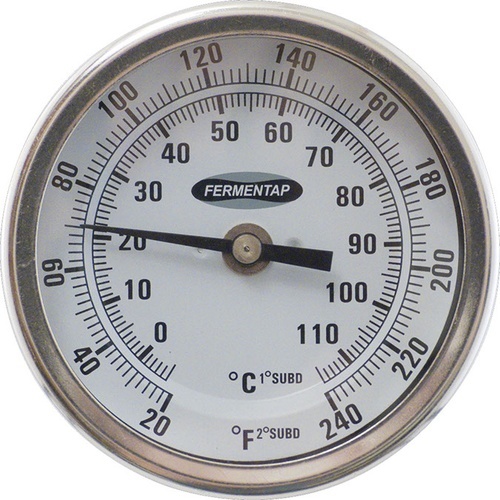 i have this connected to my counterflow with a tee fitting, it is easy to read the temp of the chilled wort as it exits. Bought this to use with the kettle in starter kit #4 as per most everyone else's reviews. Glad I did. It's the perfect size to use with the wort chiller. Numbers are easy to read, and seems to respond pretty much instantly. Right away it got a little foggy right around mashing temps, and it's been that way ever since. Otherwise pretty reliable. Just takes some effort to read it. Very easy to read and accurate thermometer. I used this on my 8 gallon stainless steel brew pot. They only gripe I have is that it's not vertical when I thread it on the weldless fitting but that is just where the threads are on the pot. Not a big deal but works great. This is a nice replacement thermometer which works well and doesn't cost you more than it should. You won't be disappointed that you didn't spend a lot more. Slow to respond. Mine was off initially, but was ok after calibration. My only gripe is condensation inside the glass, after my first test boil it's never gone away. Makes it hard to get an exact reading at times. Nice large dial, easy to read, fast response. Bought this to put on the output of my plate chiller. works very well, and I can easily read the temp. Responds to changes in temp. very quickly. Seems well built. Nice that is can be adjusted. Watch your temps from several feet away while chilling with friends and drinking a homebrew. Very easy to calibrate with a small screwdriver. Ditch the glass stem thermometer, and add one of these to your kettle today! This is my favorite brew thermometer - been using it for two years now, and still accurate to within 1 degree. Never had an issue with liquid splashing on it, and the probe is the perfect length for my boil kettle. To top it off, price can't be beat! Just make sure you have a floater to measure temp diffrence. The shorter probe works great and stays out of the way when you have to stir the mash. I replaced a 6 inch thermometer with this one, because when I use my immersion chiller, it would sit on the 6 inch stem which I didn't like. With this three inch stem, it's out of the way. I also find this thermometer to be more accurate than my old one. I'm super happy with the product and will only buy these in the future. This is a steal of a deal when it's the BEERDEAL of the day item. short stem allowed me to stir the product easier and it did not get in the way of my wort chiller. very accurate. My thermometer came without the screw and washers. Now I have a big problem, because in my country our standard millimeters and not inches as in the U.S.. This thermometer unfortunately does not come with any screws or washers, so we apologize for any inconvenience or misunderstanding. Please contact our customer service department at info@moreflavor.com if you feel you're missing parts, but this should just have been the thermometer. Works great and much easier than drop in thermometers. Works great with 8 Gallon kettle included with starter kit. I do not have anything bad to say. This thermometer fits just right in the 8 gallon kettle that came with the home brewery kit #4. The length of the probe is good enough to get an accurate reading and not get in the way when stirring and pouring in malt. Would recommend to anyone interested in buying an economical thermometer.